I am doing a SDR project at the university right now. I managed to create flowcharts with Pluto-blocks to transmit / receive FM Radio signals such as tuning in to local radio stations. I am trying to transmit messages which I manually enter using the bash. 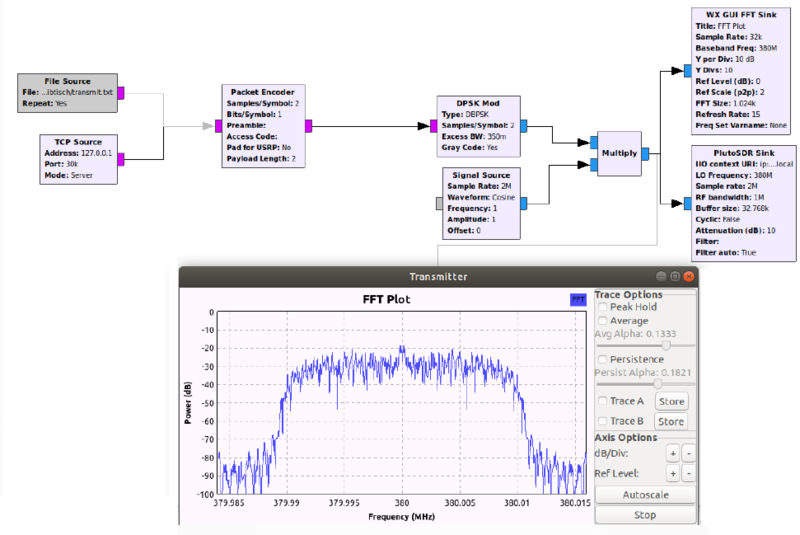 Interestingly the fft-plot suggests that something is beeing transmitted however on the receiver flowchart which is completely independent from the transmitter flowchart no signal is received. You may think that my device is broken, but if I use a txt file source without the TCP source the Pluto Device seems to work just fine as I can receive the content of the txt file. The TCP source itself seems also fine since I can skip the pluto block and write directly to a TCP client / txt file.